Hospitals are now able to address their interventional cardiology needs with Toshiba America Medical Systems, Inc.’s newest X-ray system, the InfinixTM Essential. As healthcare reform challenges hospitals to do more with less, the Infinix Essential is an ideal value system that doesn’t sacrifice performance. With its slim, off-center C-arm design, the system allows steep angulations for optimized vessel profiling during cardiac interventions. 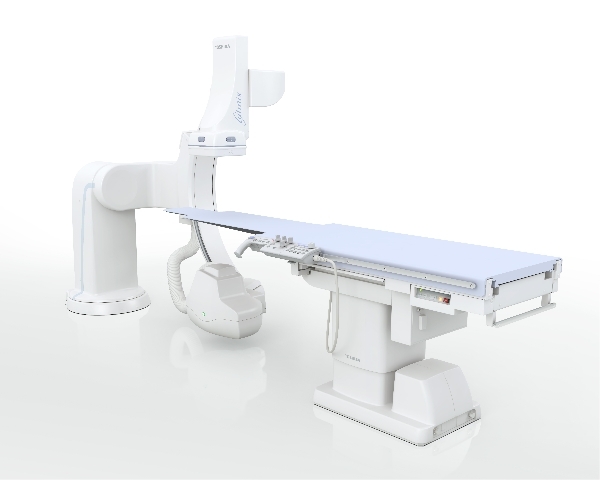 Featuring Toshiba’s revolutionary C-arm design and WorkRite technology, Infinix Essential provides unprecedented access and coverage during interventional cardiac procedures. As facilities grow, they can add advanced features to their system to perform procedures such as TAVR or left atrium appendage closures. Based on Toshiba’s commitment to achieve the highest image quality at the lowest possible dose on all systems, Infinix Essential is available with a comprehensive set of dose management optimizing tools, including Spot Fluoroscopy, Dose Tracking System (DTS) and Advanced Image Processing (AIP). In addition to the launch of the Infinix Essential, Toshiba is repositioning its line of existing cardiovascular X-ray systems to meet the needs of providers during healthcare reform. Toshiba’s Infinix Select is a shared lab solution with two differently sized, independent flat panel detectors that can perform a range of both simple and sophisticated cardiac and vascular procedures. For customers in need of a full cardiovascular lab to conduct the most advanced procedures, the Infinix Elite is available in multiple configurations and with Toshiba’s revolutionary five-axis C-arm, which provides head-to-toe and fingertip-to-fingertip coverage. These systems are available with Toshiba’s numerous dose reduction technologies and recently FDA-cleared software upgrade, for improved and expanded imaging applications.